I can remember as a child posing with family members for photos. Everyone would gather together, someone would take the picture and then the film would be sent off for developing. It could be weeks or even months before you got to see whether or not the photo ‘turned out.’ Problem was, everyone would be scattered by then and the moment would be gone. Today, digital cameras provide that instant gratification of knowing whether or not the snapshot was a keeper. Perhaps it has become a bit too easy to take photos today but for the most part the thrill of capturing special moments still prevails. 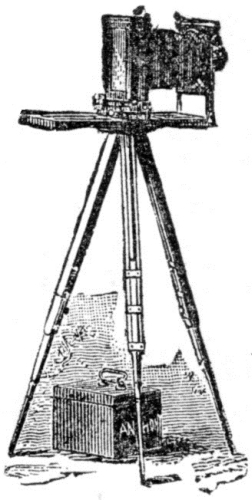 This camera with tripod illustration is an advertising image from an 1887 magazine. It’s not the best quality drawing but it is apparently the first camera image that I’ve found in the public domain to share with you. Hopefully, it will be just what you need. Enjoy.